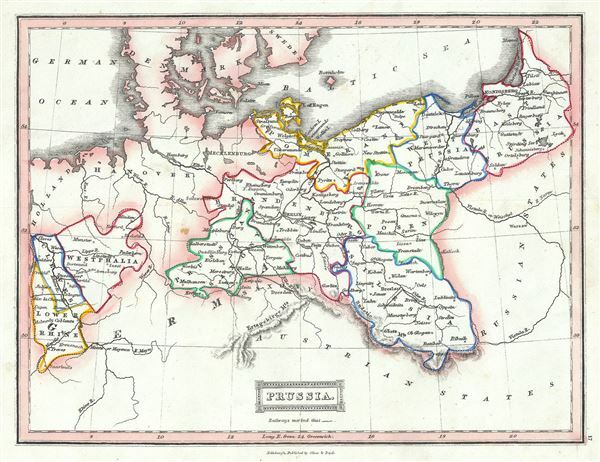 This is an example of Thomas Ewing's 1845 map of Prussia, Germany. Prussia stretches across the map from Prussian Saxony moving eastward to East Prussia and covers what is today northeastern Germany and Poland. Westphalia, Cleves and Lower Rhine are also included. Various important towns, cities, railways, roads, rivers, mountains and several other topographical details are noted with relief shown by hachure.